This story was updated on April 21 at 3:05 p.m. EDT. President Barack Obama and his family will attend NASA's planned launch of the space shuttle Endeavour on April 29, according to a White House official. Kennedy Space Center spokesman Allard Beutel was unable to confirm the president's visit, but said that Obama would be welcome at the launch. 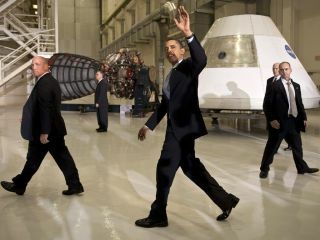 "We are a White House agency - we always welcome a visit from the president," Beutel told SPACE.com. Obama last visited the Kennedy Space Center a year ago, in April 2010, to make a speech to employees about the new direction he was proposing for NASA. Obama cancelled NASA's moon-oriented Constellation program in favor of human missions to an asteroid and eventually Mars. Next week's presidential visit will likely require extra security and arrangements during an already complex launch day at the seaside spaceport. "When he came here last April, that took a lot of special arrangements," Beutel said. "It's the president. It's safe to say there always have to be special arrangements." And Obama won't be the only high-profile attendee at the launch. Wounded Congresswoman Gabrielle Giffords, D-Ariz., wife of Endeavour's commander Mark Kelly, also hopes to attend. Giffords is recovering at a Houston hospital after being shot in the head outside a Tucson grocery store in January. Endeavour's STS-134 mission to the International Space Station will include four spacewalks to install spare parts and upgrade the orbiting laboratory. The shuttle will deliver a $2 billion astrophysics experiment, called the Alpha Magnetic Spectrometer, to the station. The shuttle mission is scheduled to last 14 days, but NASA may decide to extend the flight by up to two extra days to fit in more work, mission managers have said. The liftoff of Endeavour will be the second-to-last space shuttle launch before NASA retires its 30-year-old shuttle fleet . After the mission, Endeavour will be sent to the California Science Center for public display. Its sister orbiters, Discovery and Atlantis, will be retired at other museums. Endeavour made its first flight in 1992.